I have laid my hands to some Dior Holiday 2015 items. I have posted some swatches and a first look here. Today I would like to show you the nail polishes of the collection. There are four nail polishes in limited edition Diorific packaging which I find to be very cute and festive. The first time Dior came up with this, I was all over it. The second year (reviewed here) I remember being excited too, there was especially a very nice color in that collection, called Minuit, I still love it to bits. Then the third year (reviewed here) it was started to get a bit boring because the packaging was the same, which was alright but the shades were almost the same as well. This year is the fourth year with the Diorific limited edition packaging. I am collecting them all because I love them so much. You can see a group photo here at Instagram. Today I would like to share my thoughts about three of the four colors, Diorific Vernis #227 Gris-Or, #991 Mystere and #001 State of Gold. The fourth shade is a red called #951 Passion which I am hoping to get after the collection launches here. Let me start with a spoiler. This year there is no shade which I am head over heels like I was with Minuit but all of the shades are special in a way and I really like the collection much more than last year's which had repeats from the previous years and some very sheer nail polishes which I personally don't like on myself. Alright on to the first shade, Diorific Vernis #227 Gris-Or. It is a rose-platin-gold with pearly/metallic finish. I am usually not very fond of light pearly nail polishes because it reminds me of those shades which I used to lend from my mom at the end of 80s and the beginning of 90s and mind you my mother still wears them lol. Anyway, although my memory doesn't let anything in which looks slightly close to those rose/ivory pearls, this one has something about it which is very unique and flattering. Gris-Or is perfectly opaque in two coats. Although it shows some brush strokes, it is really minimal. Gris-Or is a different beast under different light so I decided to show you in shadow and with direct sun light. You can see that in shadow, it is more metallic and cooler. 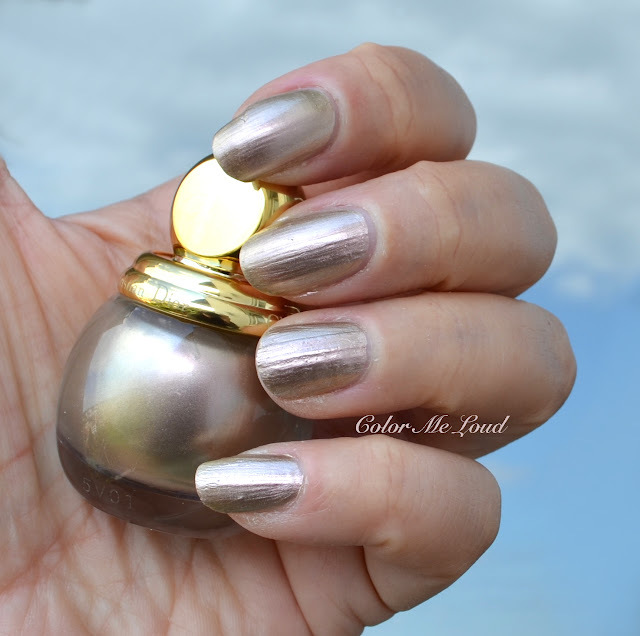 Under sun light it is more golden and it has shimmery effect close to metallic nail polishes of Chanel, ones such as Sweet Star (reviewed here), Bel-Argus or Azure (latter two reviewed here). I am wearing Gris-Or while typing this post and I am loving it so much! The top coat of this year's holiday collection, Diorific Vernis #001 State of Gold is a very densely packed glitter of mixed silver and gold which gives a beautiful effect. It is possible to apply just the glitter on its own and it would be opaque in two coats but I applied just one coat over Gris-Or and loved the result. 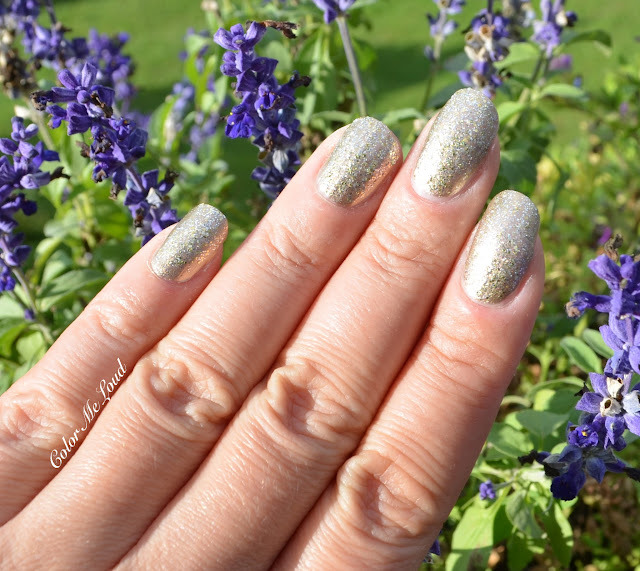 The only thing to mention about State of Gold Glitter Polish is that the resulting finish is rather gritty so if you don't like the feel of texture on your fingers, be ready to apply multiple coats of a thick top coat. The effect is gorgeous though and it is worth it! 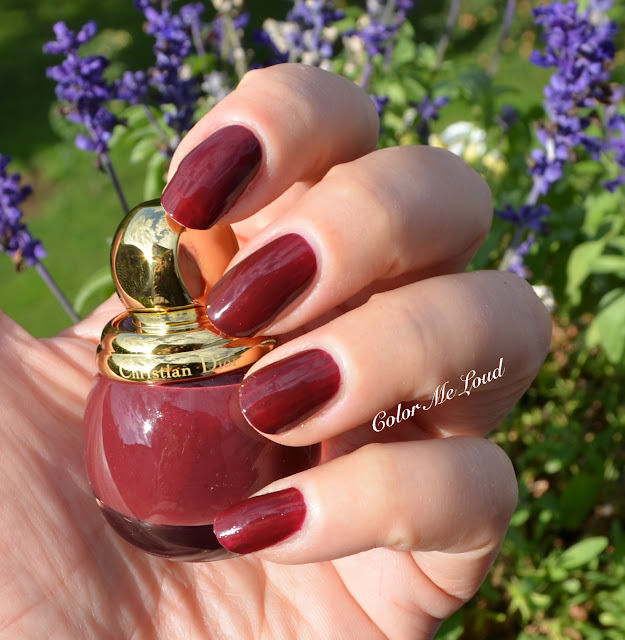 Diorific Vernis #991 Mystére is a deep warm berry, burgundy shade with cream finish. It has a bit of a jelly consistency which leaves some transparency by the first coat but becomes opaque with the second. I like how Mystére is so classically chic but a little different at the same time. I didn't go for a very extended comparison with this one but included a few recent Dior's in the comparisons and have seen that it is different enough to own. 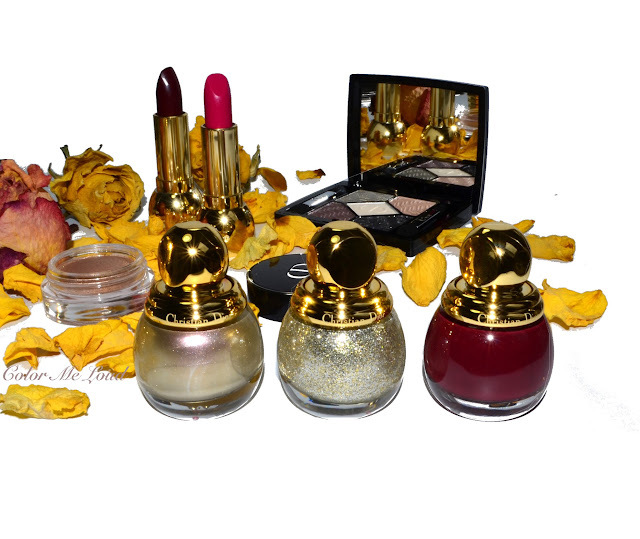 Golden leaf top coat Diorific #001 Golden Shock was less dense and the glitters were bigger in size. Diorific #001 State of Gold has stalled glitter and it is much more densely packed. First I thought Diorific #227 Gris-Or would be very much like Chanel #629 Atmosphere (reviewed here) but I am so glad to report that it is not close at all. I like Gris Or much more although the duo chrome effect is not so prominent but the base color is much more there. I also included Diorific #318 Frimas and Diorific #207 Diorling but they are both very different than Gris-Or, which is a very unique color to my stash. Final thoughts: What a nice surprise, I am loving all the three shades! 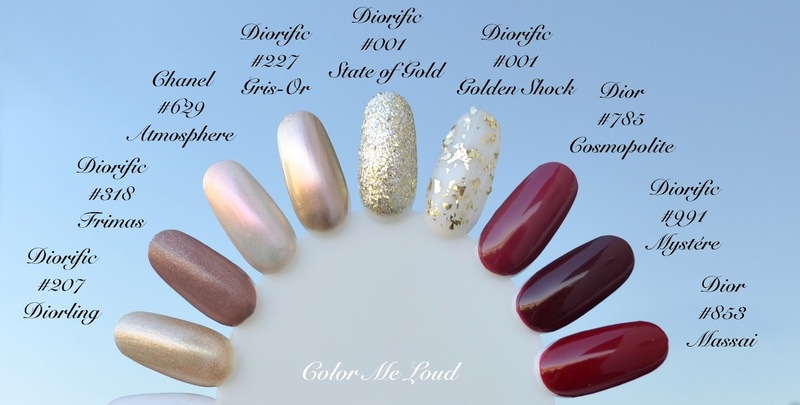 My favorite though is definitely Diorific Vernis #227 Gris-Or which is a very unique platine rose gold which would look even more gorgeous on cooler skin tones. State of Gold is lovely if you don't shy away from glitter or if you don't get too lazy to remove them (try foil method!). Dioramic #991 Mystére is also a gorgeous shade, lovely for Fall and Winter alike. Both the shades are lovely but I'm not into full on glitter on my nails. I still can't get over how cute the packaging is. Very pretty! Oh yes I love Gris - Or ! And Mystere ! So happy that it's not like Atmosphere from Chanel ! I never tried glitter before on my nails and I'm not fond of the feel that leaves on the nails so probably just Gris Or and Mystere for me :) thank you for your comparisons swatches! Mystere speaks to me :-) I always love darker shades on the nails! Honestly, I think i might just purchase one for the bottle design.. Haha! They look absolutely beautiful. Mystere is a shade I'd love to add to my collection. Mystere is the stand out shade, but there is something quite dupable about about it. I wish they would have designed this color with a little more pizzazz like Minuit from two years ago--remember that one? I use it occasionally for fear of running out. As for the 80's and 90's comment--that was spot on. Then again, what's old is new again baby!!! Great post.